Bringing a new puppy home to your apartment is an exciting occasion—you’re getting another best friend, after all! However, making your apartment safe for your new puppy does require quite a bit of preparation. Failing to prepare could result in damage to your rental, which could mean losing your security deposit. In fact, 10 percent of renters said they lost their deposit because of a pet in a Rent.com survey. You know your kitchen cleaner is toxic, but to your new puppy, those bottles seem like they would be awfully fun to chew. Because you likely store cleaners and other chemicals on the lower shelves throughout your apartment, you must prevent your dog from invading! Dogs can be pretty darn clever when it comes to getting into things they shouldn’t. Head to a hardware store and purchase enough childproof locks for all of your cabinets. These devices are designed to require some critical thinking skills to open. For example, you might have to hold a couple of buttons while simultaneously opening the door. You have two advantages when it comes to operating these locks that your puppy doesn’t: opposable thumbs. One human’s trash is another dog’s treasure. As such, puppies tend to dig through garbage to find the food you tossed after dinner, among other things. Make sure all the garbage cans in your apartment have closing lids. Locking lids are even better. Don’t skimp when buying a can. Some models have lids that are easy to open, even for a dog. Play around with the garbage can at the store to determine how easy it is to open. Bathroom, living room and bedroom garbage cans should be as challenging to access as the one you get for your kitchen. The theme of puppy-proofing your apartment is that everything could be a chew toy in the eyes of your new pet. While your slippers aren’t apt to harm him, a power cord might. All of your various cords—from power strip or your phone charger—should be off the floor, out of sight or tucked away. Consider placing furniture in front of outlets, keeping power strips on top of tables or running cords through a cable-managing tube. Your puppy will get attached to you. You’re his new human! While cuddling with four-legged friend is one of the perks of attachment, his love can be frustrating at times—mainly, when he eats your stuff. Dogs are drawn to things that smell like their owner. Your shoes, hats and clothes are all fair game. Fortunately, your apartment has these nifty built-in storage units called closets. Make use of them! You can purchase door-mounted shoe racks and other devices that will keep your belongings safe behind closed closet doors. Just make sure you always put your things away when you’re done using them. The space under your bed or behind the sofa looks super-fun in the eyes of your dog. However, those areas could be hiding fallen debris you don’t want him eating. 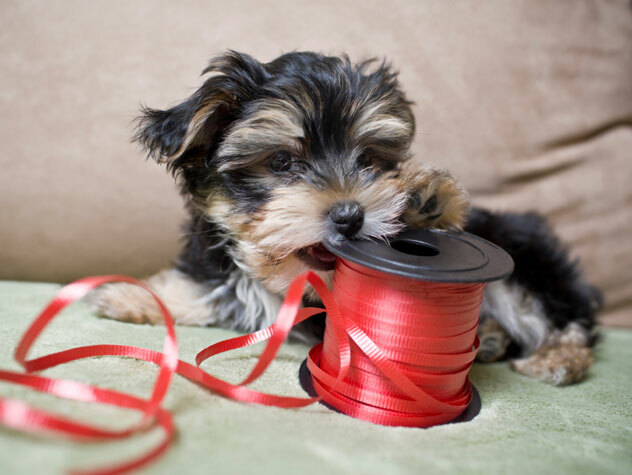 Whether your bobby pin rolled beneath the bed or you store clothing there, your pup could get into it. Your best line of defense is to block access to these tight spaces. You can build blockades by using boards or simply place other furniture in front of access points. Eventually, your puppy may grow too big to squeeze into those areas anyway. So you have childproof cabinet locks, covered trash bins, hidden cords, closet contraptions and blockades all ready to go. Now you need to step into your new puppy’s paws, so to speak. Get down on the ground and snoop around your apartment as if you were a dog. Do you see crumbs under the desk you didn’t notice before? Does crawling beneath the bed seem doable? What about your toilet seat? Is it up? (Puppies like drinking from an open toilet bowl). Make adjustments as you scour your place so that everything is in order when you bring home your dog for the first time.